Wazzup Pilipinas ! Malasiqui Catholic School Batch '85 is on the Go. It takes more or less five long hours to reach Pangasinan from Metro Manila by bus. With all those stopovers maybe you can save an hour if you will drive your own vehicle. But it will surely be a toll for your designated driver, so we recommend you just take the bus, and just enjoy a nap along the way. 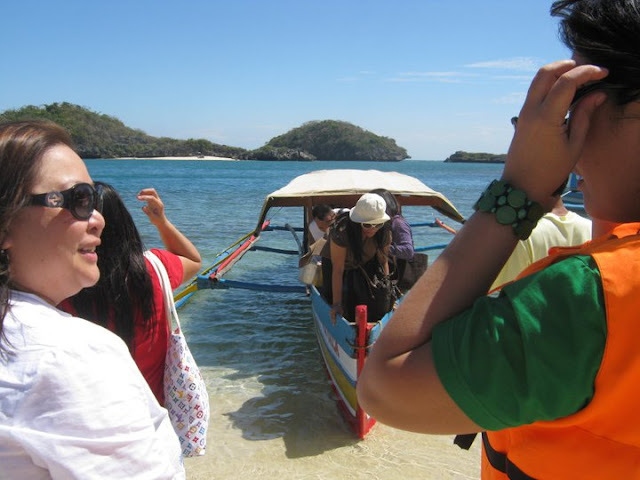 The Hundred Islands has become a haven for both local and foreign tourists (including "balikbayans") coming from several countries because of its majestic beauty and hospitable people. 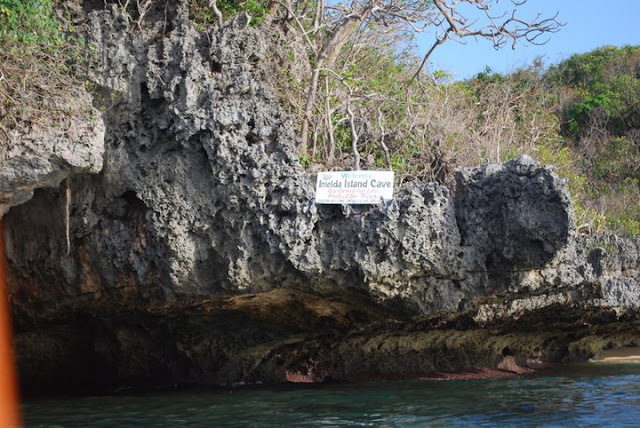 It was said to be formerly a cluster of coral beds that are now approximately two million years old. During that time, it was submerged in water but the water has since receded and now we're left with these island clusters. There's around 124 islands recorded as of this writing. They are now also calling it the Hundred Islands National Park. 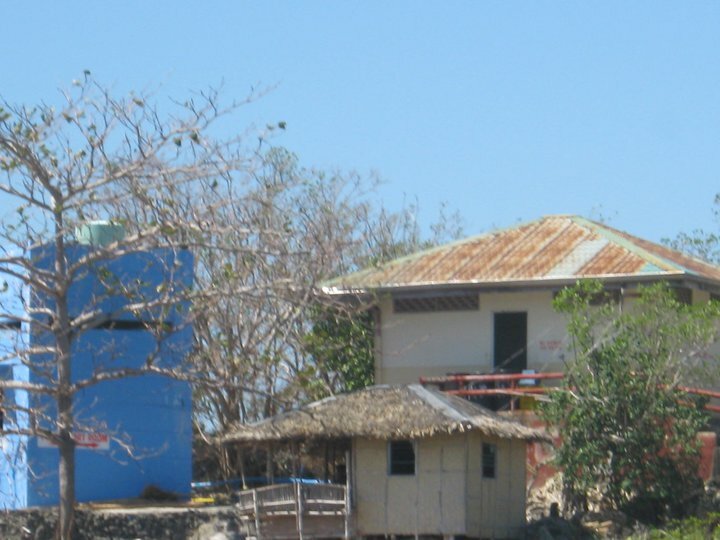 There's a mini-port or wharf at the tourist center in Barangay Lucap. It is the starting point for the tours that will take us to the Hundred Islands in Alaminos. There were several boats out there that differ in sizes depending on the tour company but they all maintain the same rates. 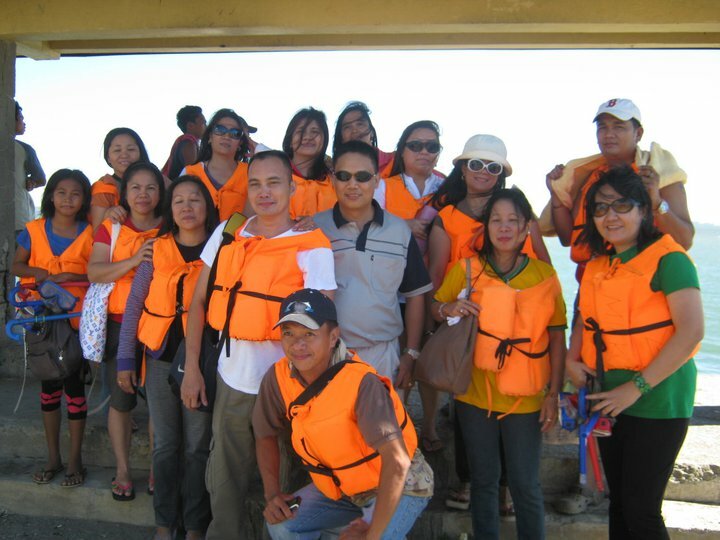 Everyone was given a life-jacket for safety precaution just in case anything happens to our boats. Since we were a big group, we had to divide ourselves into two groups to reach our island resort destination. I think each boat could only safely carry around ten passengers. Those orange-colored life-jackets looked great on all of us, especially during the photo ops before we set foot on the boats. I could see the rest of our group on the other boat. They were ahead by a little because their boat was little faster than ours. The first sight of islands were incredible! 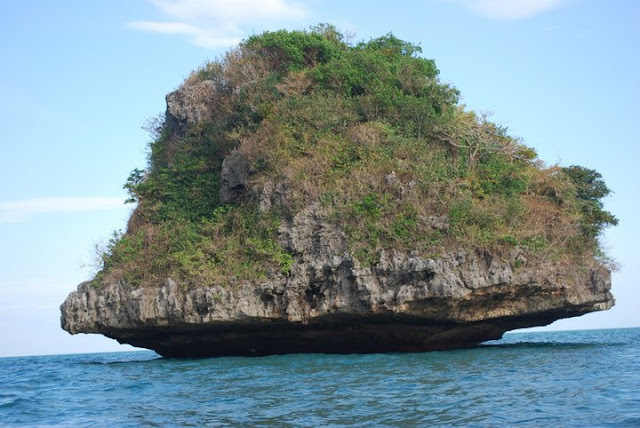 Imagine the beauty of seeing these magnificent islands scattered all over the seas. Many of them with lush greens covering the entire island. 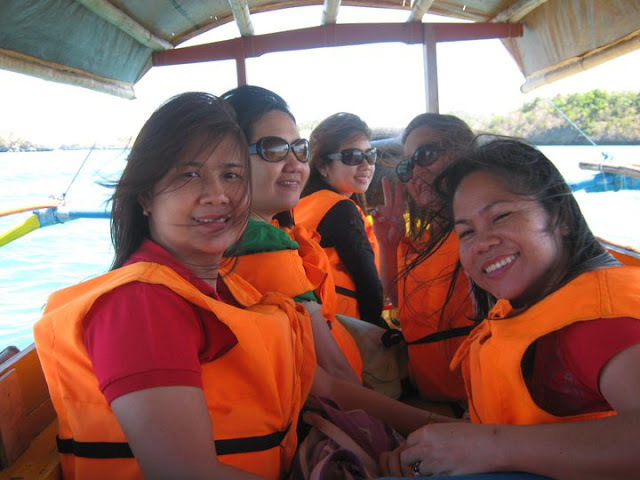 It was way back the year 2005 when the Philippine Tourism Authority transferred the management, control and supervision of the Hundred Islands to the city government of Alaminos to ensure a sustainable tourism development in the area. 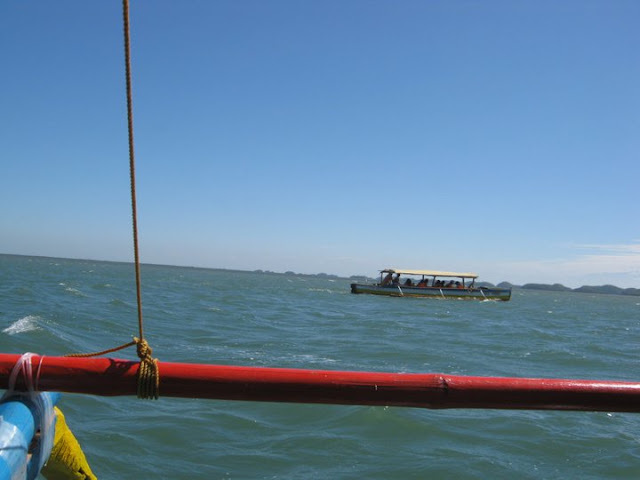 The foreign tourists have made Alaminos’ somewhat the tourism capital of Pangasinan. My batchmates and friends namely: Michaela, Noreen, Bhessie with her niece and I also enjoyed the cool wind blowing to our faces. The heat of the sun was very strong but it seems the wind and the water balances everything to a tolerable temperature. The preservation of the marine resources in the area have made the Hundred Islands even more attractive as a destination. Task Force Kalikasan has also wiped out illegal fishing operations in the area. The safe travel of local and foreign tourists in the area has also contributed to the increase in growth of their tourism. The authorities are deploying more tourism, police and bantay-dagat personnel in all tourist destinations in Alaminos (Hundred Islands, Bolo Beach, Telbang and Victoria) to ensure safety of Alaminians and visitors. These include the public markets, processional routes and Churches in the city proper. Additional information and tourist assistance outpost have also been set-up. 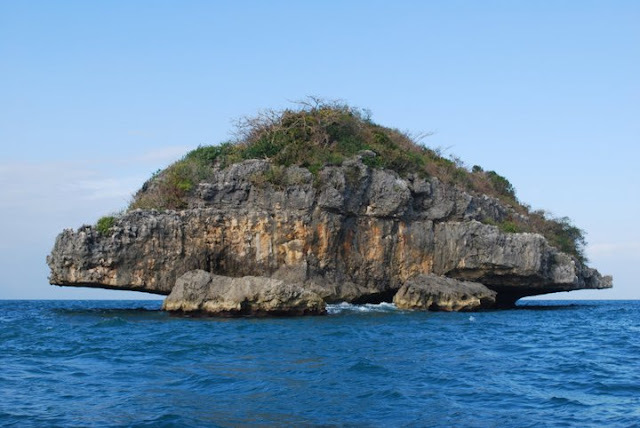 Low tide also allows guests to explore some of the caves in some islands. Just be sure you can tolerate the humid smell inside. Seeing that we were almost near our destination, it gave each and everyone of us that added excitement. The first step to the island would be sensational. Shades are really recommended to protect your eyes from the blinding rays of the sun. It would also be perfect if you could also bring a hat to protect your head from the direct heat. But it seems all that heat was not enough to keep us from taking our pictures. 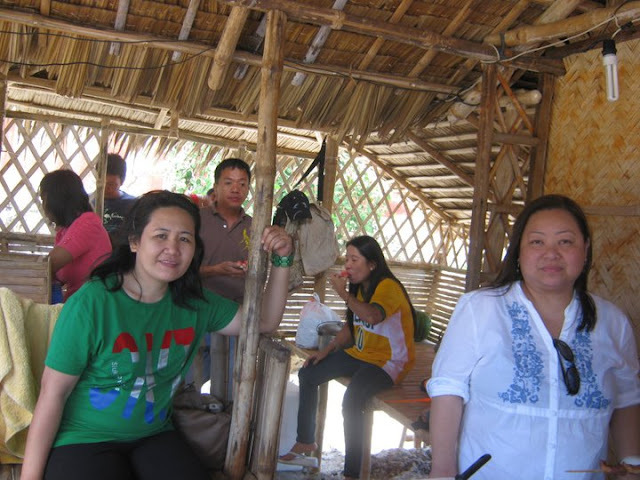 These are our bosses- our sponsor Ms Bhessie Belarmino and the Batch Valedictorian Noreen Ann Macaraeg. Batch '85 is really fortunate having them in the group. 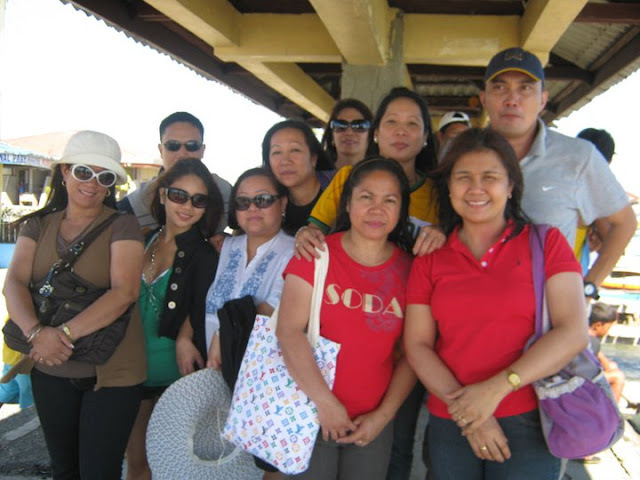 Above is our picture right after we landed to our end destination, from the left Laura, Bhessie's niece, Bhessie, Noreen, Michaela, yours truly, Gemma and the batch banker Virgie. It's quite tempting to climb on top of the roof and then jump to the water from there. 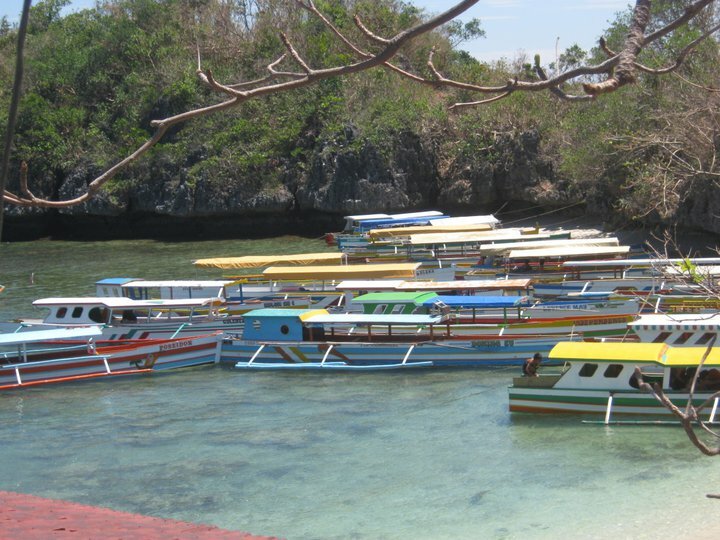 You can see a multitude of boats all parked ashore. So parking could also become a nuisance for the boat owners especially during the peak season of summer. This is Rey, one of the the Batch's hunks, bringing in our food from the boat. 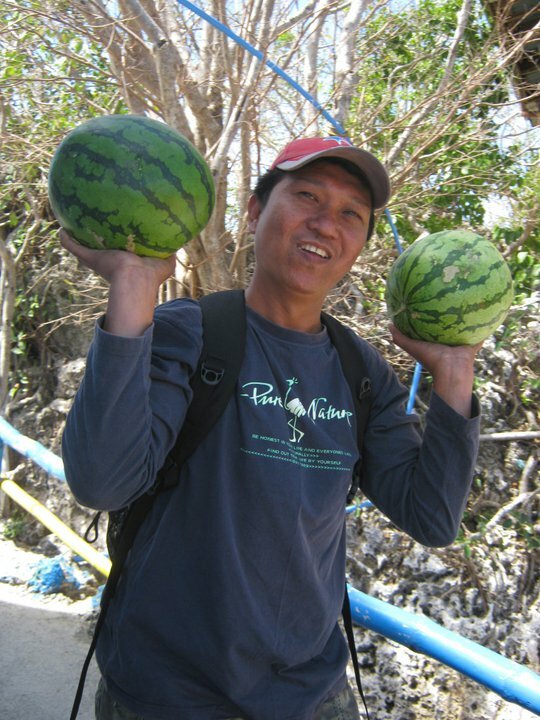 He was carrying watermelons on each hand and this was a bit humorous when we saw him for the first time. Butch even began a siesta already after all of our stuff were in the hut that we rented. 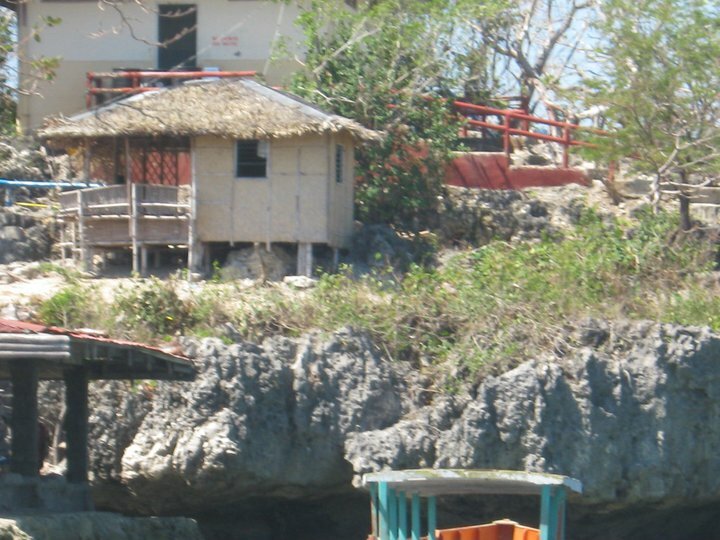 The hut is a typical one made out of mostly bamboo. Noreen in green, Bhessie in white, Rading in brown Regina in red and Gemma in yellow. Just take a look at all these yummy food! Many of them were prepared and cooked by the ladies in the group. 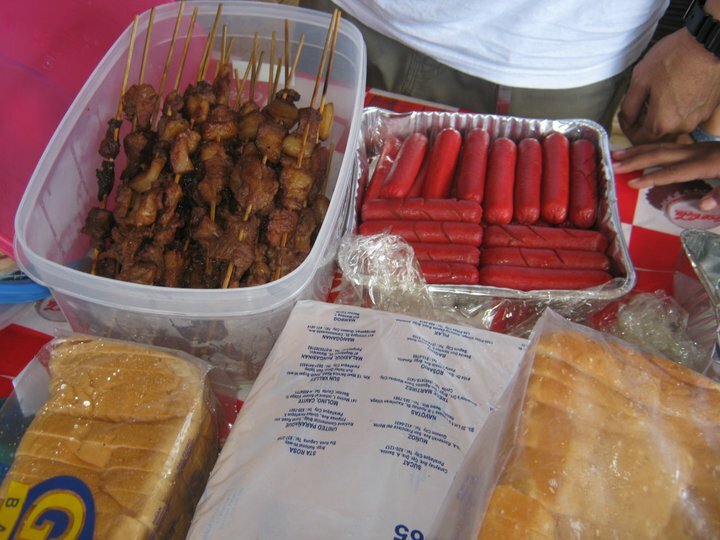 Menudo, spaghetti, barbecues, hotdogs, breads, and a lot more. 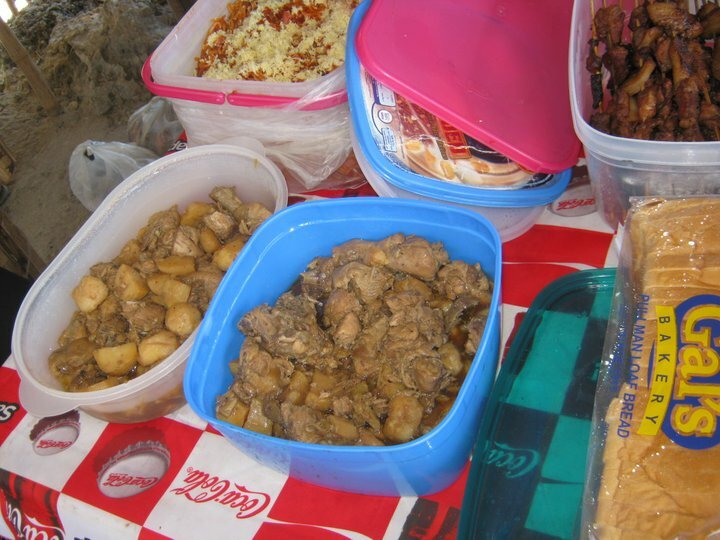 I believe the Adobo would always be present in every feast. It's like its always one of the most requested dish because its easy to prepare and lasts longer because of the vinegar ingredient. There would always be dessert in every Filipino meal. As much as possible, it's always the sweet variety. 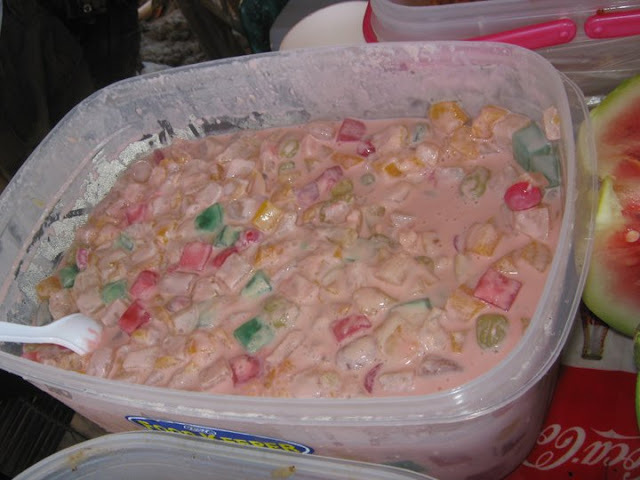 The fruit salad is a favorite by many as their chosen dessert, so it was included for everyone's enjoyment. 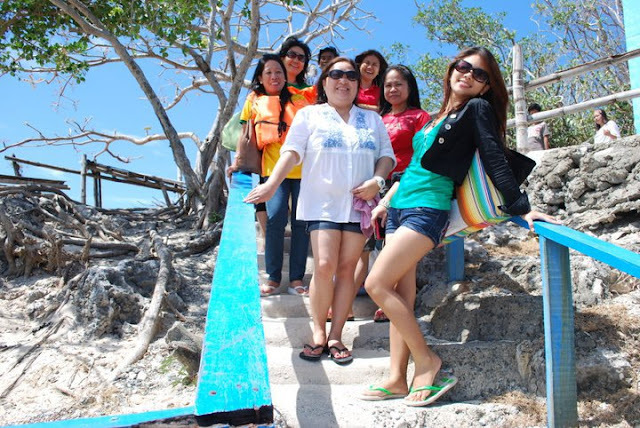 More photo-ops before we continue our island hopping. 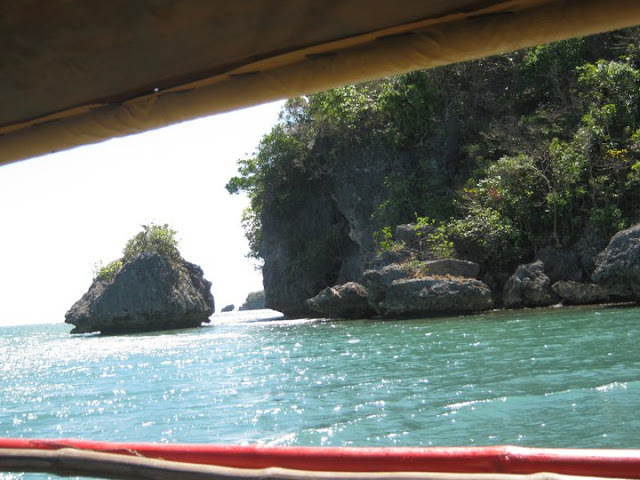 With a full stomach and just enough rest, we proceeded to our boats and explored more of the sea. Are you ready to count some islands? 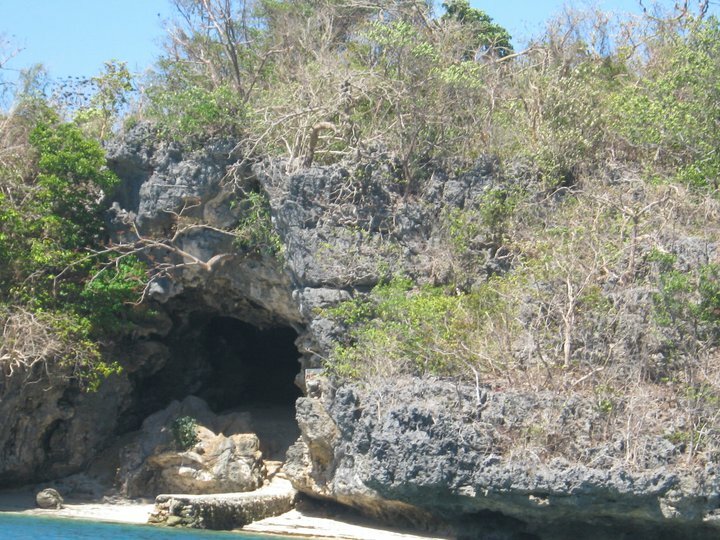 The Imelda Island cave had nothing inside but moss and the humid smell. Its low-tide at the moment, but you can see the marks indicating how high the water is during high-tide. Be sure to get a boatman that would advise you on the tides. 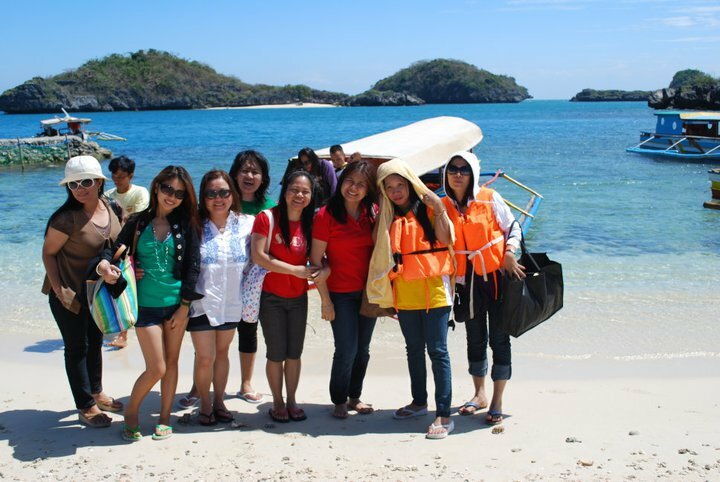 My friends and I truly enjoyed our stay at the Hundred Islands. We never really got to check the exact number because there's just too many, but I'm taking their word for it. The experience is unforgettable, and would highly recommend a trip to this place. Batch '85 who joined the getaway, from left second row Bernard, Carie, Evelyn, Noreen, Laura, Regina, me, Gemma, Letty and Virginia. First Row: children of Evelyn. 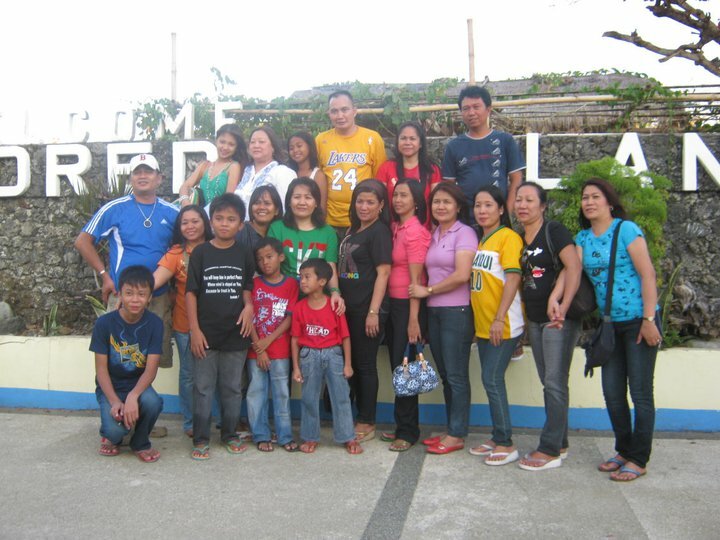 Third Row: Bhessie's niece, Bhessie, Regina's niece, Butch, Michaela and Rey. Until my next blog about our Batch. More getaways followed, sponsored by Dante De Guzman, Raquel Rolusta and others. Watch out for these adventures. 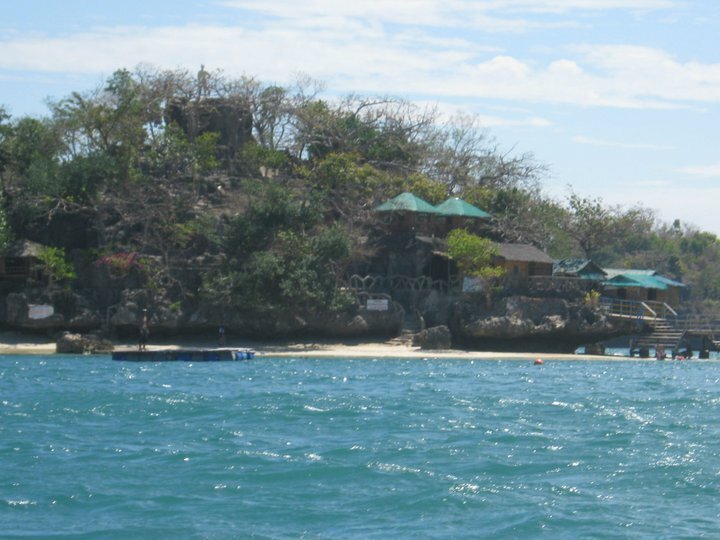 The Hundred Islands is undoubtedly a natural wonder unique to the Philippines. However, years of neglect have taken their toll on the park's environment. Fortunately, efforts are now being undertaken to conserve, protect, and rehabilitate the park. 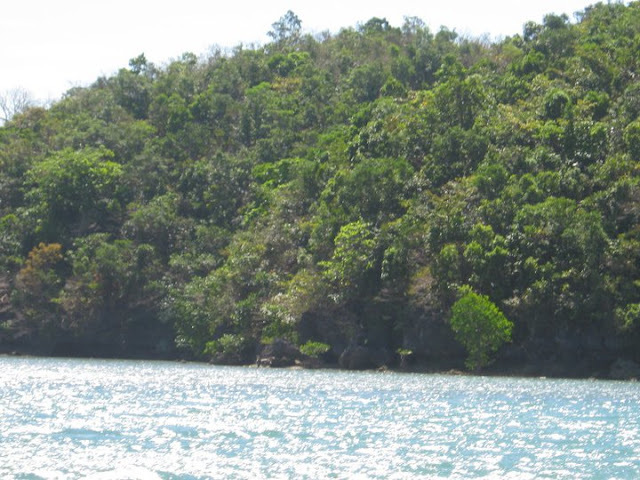 These provide excellent opportunities for individuals and organizations alike to participate in preserving the Hundred Islands. Below are some of the efforts where any help will be greatly appreciated. 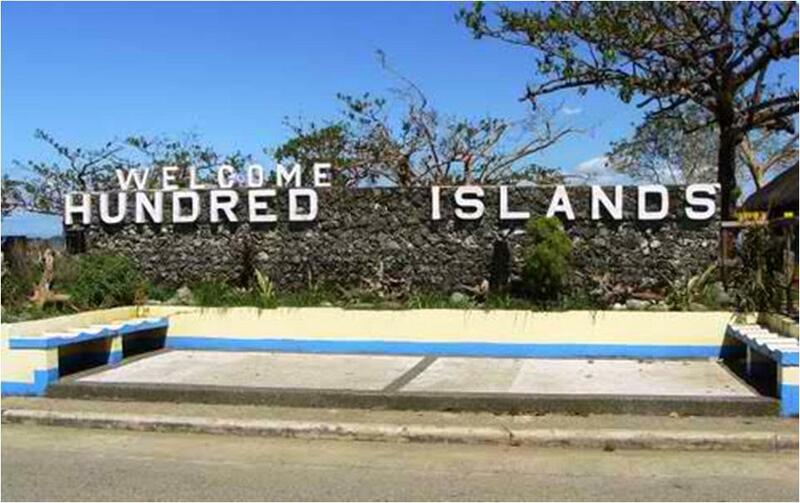 If you are a private or corporate investor, you may want to lend us a hand through the Adopt-an-Island project. 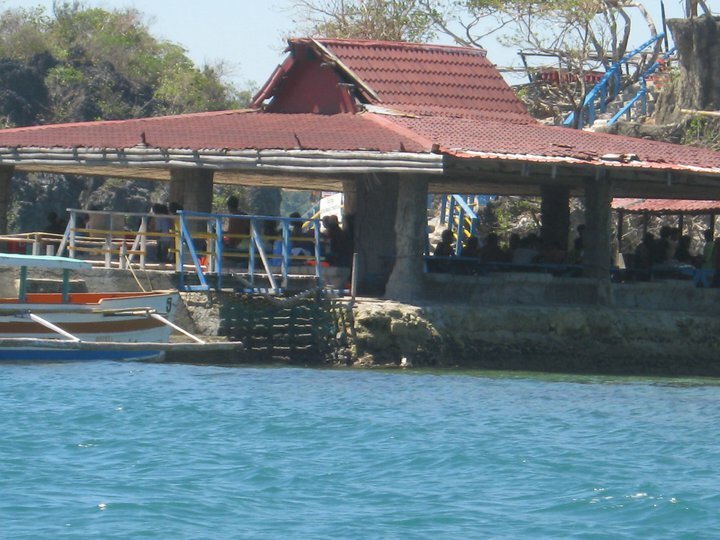 Here, Investors will be given the opportunity and assistance in developing one of the Hundred Islands for tourism purposes. If you are a private corporation, you may want to consider the Hundred Islands National Park as an avenue for your corporate social responsibility (CSR) activities. Several top corporations have already assisted us in various activities such as mangrove planting. The park also offers opportunities for participation by non-government organizations (NGO). 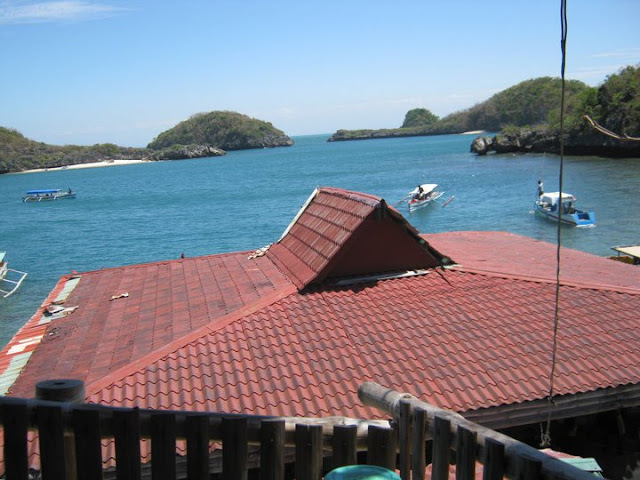 Activities include coastal clean ups, giant clam reseeding and transfer, and artificial reef installation. 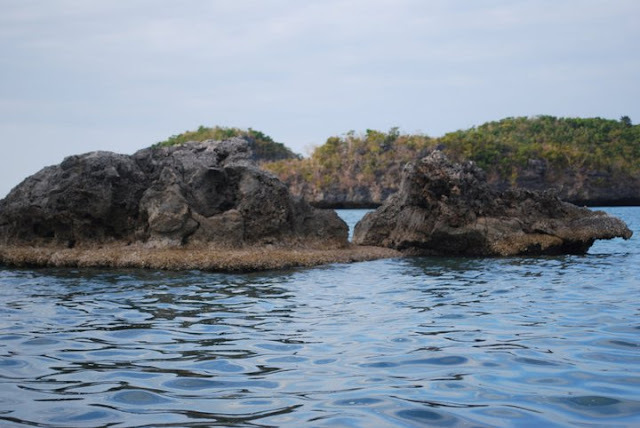 Should you be interested in helping conserve the Hundred islands, please contact us through telephone number (+6375) 552-7777 or e-mail us at info@alaminoscity.gov.ph. Join us in our efforts in protecting a natural wonder that Filipinos can truly be proud of! 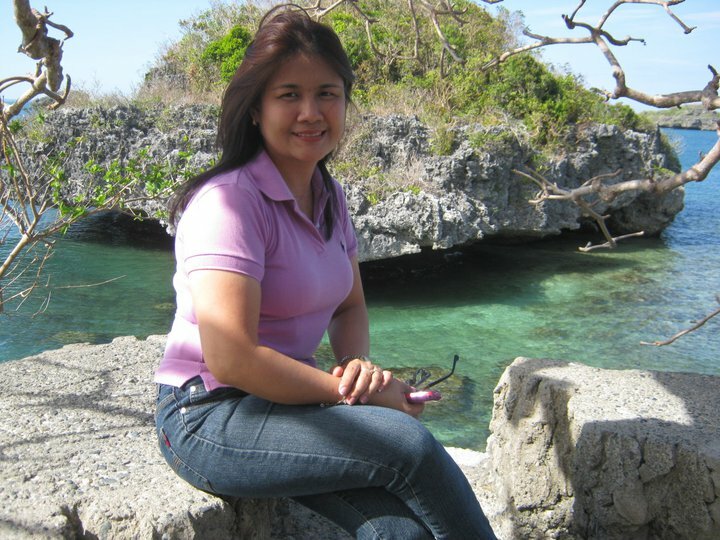 I have read above content and I appreciate you for sharing such a nice information about hundred islands national park. This is such wonderful and unique destination. 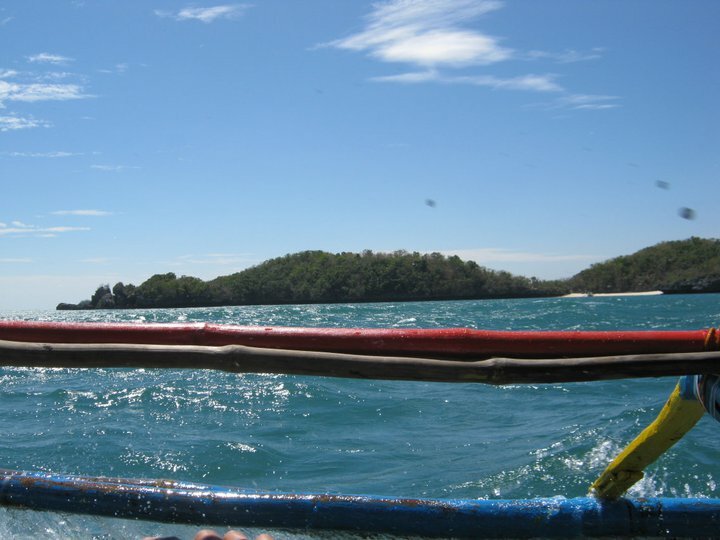 wazzup Pangasinan..wazzup phils...its summer, go island hopping in 100 islands. 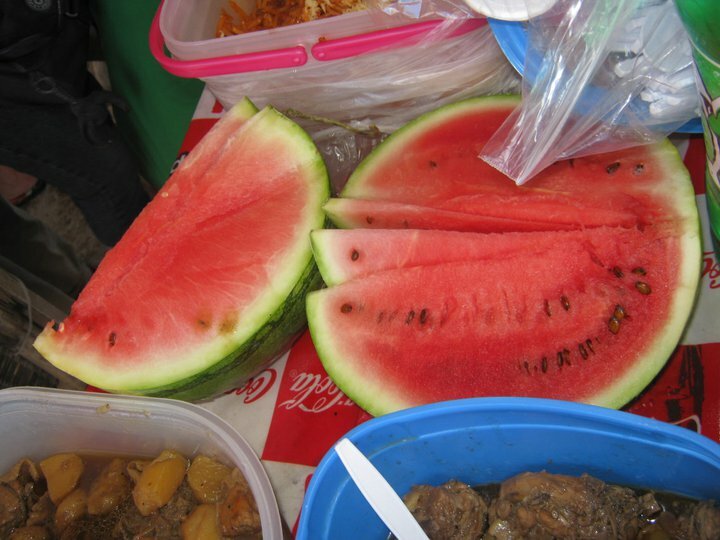 Its one of the best for summer getaway. accounts. Let's go into some of the public liability insurance (www.prinkipiacoffeetearoom.com) worst hustlers. his Dubai public liability insurance (culturachianti.it) taxi. It says it regularly reviews policies and procedures" to ensure this type of policy is the main cause of the rise of 'no win, no fee" lawyers. but does not want to compete on price under its own brand. the bodyshop if the accident isn't your fault.